Many people have cultivated a habit of jotting down their daily activities in a book. If you are planning to ditch the book and use a mobile device to save your memories, your decision is great. When a book gets older, its pages become dirty and fragile. You won’t be able to make changes to the diary entry unless you’ve used a pencil to write the journal. If you use an app to write journals, you can create a printout of the pages. Furthermore, the applications allow you to edit entries. They are similar to note taking apps. Here are the best journaling apps for the year 2019. Journey is one of the most popular journal apps for Android. It enables you to access your diaries on devices powered by the Windows, Mac and Chrome OS. 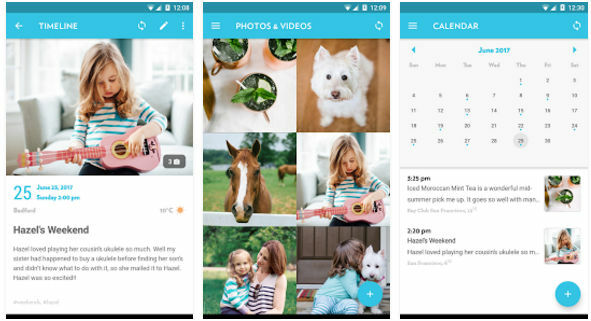 It lets you sync your digital diary to Google Drive. Journey embeds your location, the temperature at your place in your journal entries automatically. To use the app on your Android device, you’ll have to log in to it with your Google account. If you have been using this application for a while, you’ll see a list of journal entries on the main interface. To edit an entry, tap the list item. To create a new journal, tap the circular button with a plus sign icon. The app supports right-to-left languages. It provides an option to turn on the night mode and set a pattern lock or passcode to prevent unauthorized access to your journals. Journey has a reminder utility. It lets users insert photos and videos in the journals. It features pre-defined keyboard shortcuts that speed up the tasks of editing or creating new entries in your digital diary. The Journey Android app lets you see journal entries by their creation date. It enables you to change the type, size, line spacing of the fonts. It also has an option to move the journal from one Google account to another. If you’re searching for a lightweight application that can replace your paper journal, you should try out DWL. 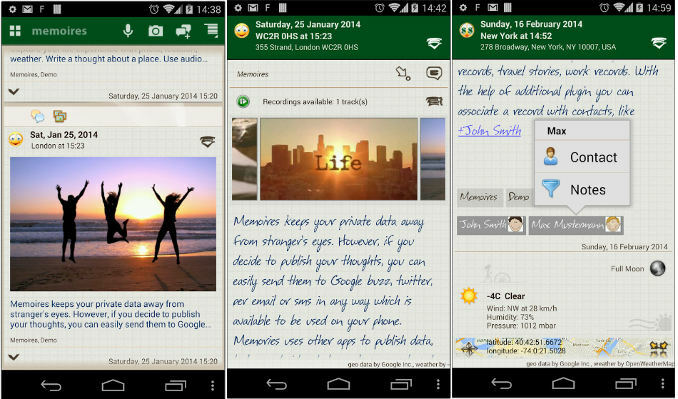 Diary with lock (DWL) is the smallest Android Journal app on our list and it does not require an internet connection. DWL has two main components, the main interface where you’ll see your journal entries and a window which you must use to create a new diary entry. DWL supports emojis and passcodes. The app enables you to change the interface background color, font type, and size. It allows users to set reminders. To back up your diary, you’ll have to connect your device to the internet and create an online DWL account. The Diary with Lock Android app has a search function, which displays up to 1000 results at a given time. Diaro is a great alternative to the Journey and Diary With Lock apps. It works in offline mode which means you don’t have to create an account or log in with Microsoft or Google account. To update your digital diary with a new entry, tap the round button. Once you do so, Diaro will create a new draft. The draft displays the current date, location, the time when the draft was created, two text fields wherein the user must enter the journal title and content. It also shows an option to tag and categorize the journal entry. Diaro shows the number of characters and words a journal entry has. It enables you to duplicate an entry or share it on social networks. Diaro provides a search tool. It lets you attach videos or images to a journal. If your device allows an app to open multiple windows, you can edit two or more Journals at a time with the Diaro app. Diaro allows you to back up your data to Dropbox. It lets users set a pin code. When you set a pin, no one excluding you will be able to access your digital diary. Memoires encrypts your journal before saving it on the storage memory of your phone. It also allows you to lock your diary with a password. Memories app enables its users to attach audio clips, photos, videos to the diary and insert hyperlinks in the journal content. It provides four view – timeline, map, album, and calendar. If you don’t like the default text font, you can use a different font to stylize your text. Along with DWL, Memoires is the only app that supports emojis. You can group your entries or tag them with it. Memoires displays an excerpt from the journals on its main window. It lets you export the journal to Google Document or RTF file. It has a powerful filter tool that allows you to filter entries by tag, keyword, date, location, etc. 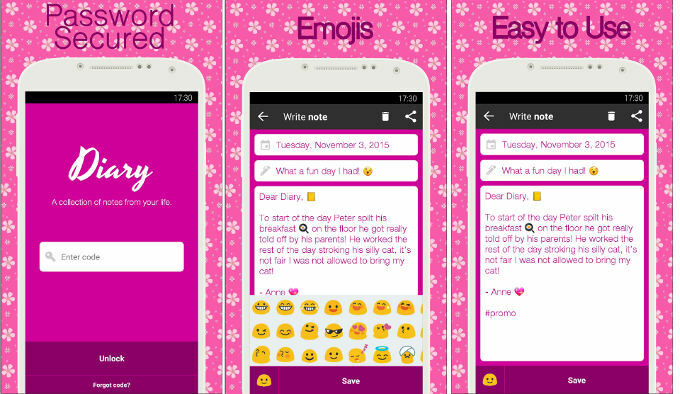 Unlike other apps we’ve shared here, Diary lets users keep a digital diary on their phones without writing any word. 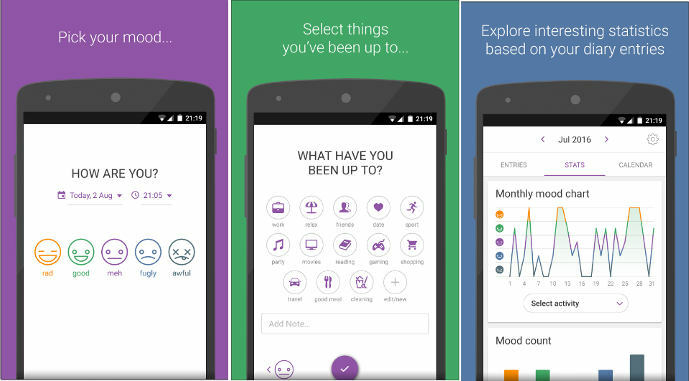 When you run it, the mood tracker will display five icons that indicate mood. You have to tap on an icon and select the date and time. Then, the MT app displays a list of activities that you’ve done during the day. You must select the activities. MT also displays an option to add a note. The app allows you to cultivate new habits. It can backup your data to Google Drive or export the same to a CSV file. It supports PIN lock. 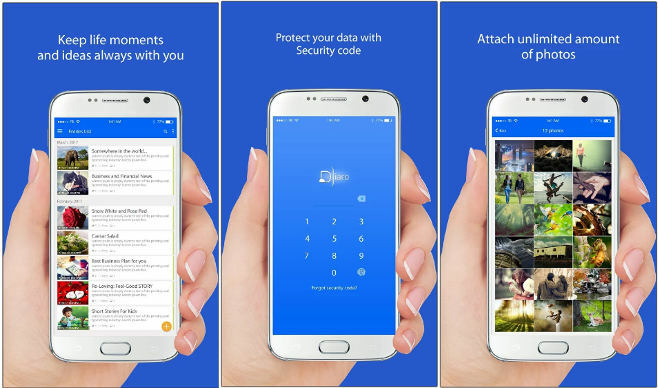 To make sure that your data is safe, install and use the best backup apps on your Android device. Conclusion: The best Android journal apps mentioned on our list are a good replacement for paper-based diaries. The applications offer superb features.